I got to know of this book because the author Michael was posting about it on Conceptart.org. 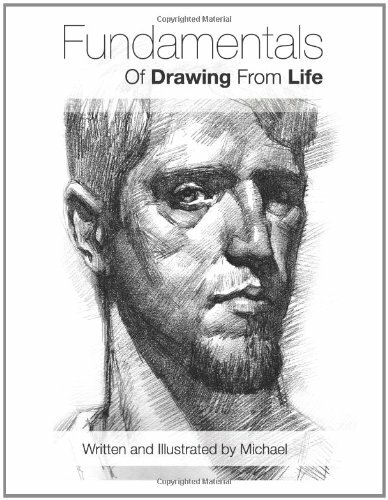 This is a book on drawing from life, or more specifically, drawing what you see. It's a 102-page paperback. As the title suggests, the book covers the fundamentals of drawing. The emphasis is on understanding measuring, simplification and value and tones. The subjects are limited in a sense, because I would consider composition important too. The book's heavy on the text that explains the rational behind the concepts. His words are easy to understand and if you've always wonder about the basics, they might be enlightening. There are no hands-on tutorials though, with the exception of some ideas for exercises. This is a beginner's book but I would not recommend it as a first book to get. It works well as a companion book to other technical drawing books, especially if you just copying examples and don't understand what you're drawing. I think a hands-on book with more exercises is more appropriate for beginners. This book helps reinforce the basics of drawing. If you feel you already understand the three concepts well enough, you can skip this book.